Happy New Year everyone! The new year weekend was fun, and we had family and friends over, and there was eating and drinking and general merriment and now everyone is back to work. And my son had a new year’s gift in the form of his vaccine shot, so he was not a very happy trooper after we left the hospital. But he was fine once we got home and he got a chance to play with his new giant caterpillar toy, which was his real new year’s gift from his aunt. I haven’t posted in a while, but that is also because I was away, visiting family in Chennai. Each time I go back, I am reminded why I love the city so much: the food! From the freshest seafood to the softest idlis, Chennai has so much to offer. And whenever the whole family gets together in Chennai, there is always a lot to eat. After so many wonderful breakfasts of idlis, dosas, pongal, upma and puttu, I couldn’t bear the thought of getting back to Special K this morning. I needed a South Indian breakfast. Since I didn’t have time to go grocery shopping after getting back, I had to make do with whatever was in store. I had a few packets of rice sevai, some coriander, and lots of lemons. And I thought: lemon sevai! Rice sevai is a kind of thin rice noodle. Easy to make, and very versatile. You can turn it into a breakfast dish, cook it with warm milk, sugar and some spices to make payasam, layer it with chicken to make a biriyani…pretty good stuff. In a wok, heat the oil. When the oil is hot, add the mustard seeds and let them pop. Then add the white urad dal and the turmeric and stir fry for a minute or two. Next, add the cooked sevai, the curry leaves and lime juice and cook till everything is evenly coated. Add salt to taste. A good coconut chutney needs lots of grated coconut, and some mustard seeds and curry leaves for tempering. But I was lazy. This is my quick-fix chutney. Just put everything together in the blender and whizz (or zhuzh) around till it is well blended and light green. That’s all. A nice bright start to blogposting in 2012. That was a pretty good breakfast considering I was working with a nearly-empty refrigerator. 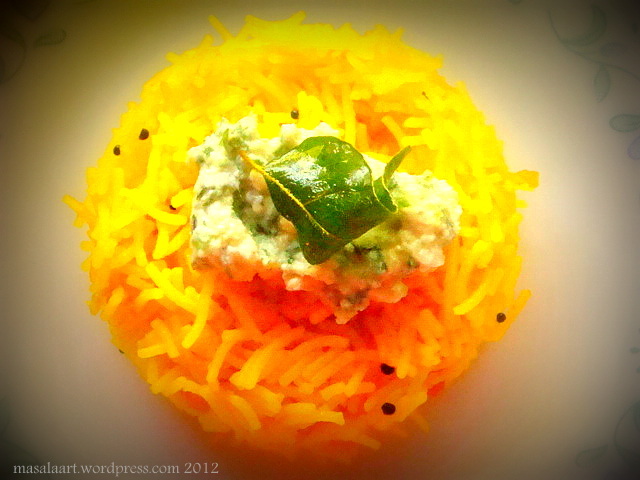 When life gives you lemons, and you are South Indian, you make lemon sevai! hey i like the “when life gives u lemon & the south indian bit in the end” 🙂 i enjoy making this sevai as a breakfast as i find it very delicious & light… my hubby is a huge south indian food fan & i m yet to master most of the south indian food…your post reminded me that i must take the sevai pack that i have kept in the dabba & make it in next few days…i like the yellow color tht u hve added to the sev… will try it this time.. thnaks for this post… wonderful! it’s very difficult for me to get my head around eating this in the morning. I would love to travel more to understand all the different cuisines eaten around the world. Haha! It is an acquired taste, I’ll admit. It’s actually an all-day food…tea-time snack, breakfast, lunch, whatever. But yes, the yellow can freak people out! i don’t really like sevai very much but the photo is so awesome!